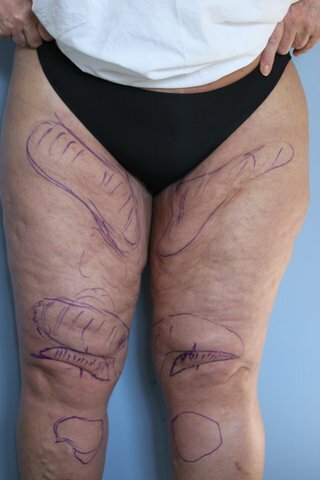 Medial Thigh Lift Reduction Surgery to remove excessive skin and fat from the upper medial thighs, reshaping to a smoother better proportioned medial thigh contour. 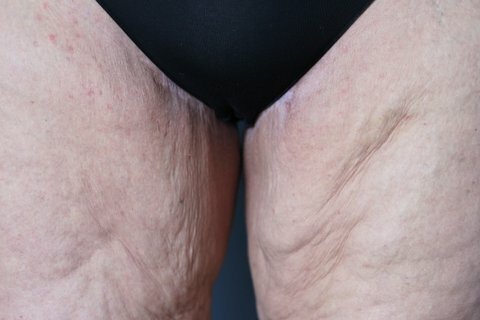 Excessive weight gain or significant weight loss, genetic predisposition, or post liposuction can result in heavy medial thighs rubbing together, with excessive loose sagging skin. Fitness and weight loss effort may not achieve the goal of firmer and more youthful looking thighs. The procedure involves hidden incisional lines in the groove beside the labia majora passing from the front to the back. The skin is lifted upwards, removing excessive skin, liposuction is often performed with the lift maintained by internal deep sutures. 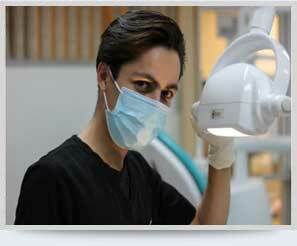 The result is a firmer, smoother and better proportioned contour of the medial thigh. The results are very pleasing and the down time is two weeks. Medial Thigh Lift Cosmetic Surgery results in firmer and slimmer medial thigh, with normal contour and tight skin. The fat bulges are removed and the skin pulled up and producing a more youthful looking firm thighs. After surgery the thighs no longer rub together on walking with a distinct space between the thighs. Patients are able to feel more confident wearing firm and fitting dress and beachwear.